It's a process that consistently makes coaches and athletic directors look petty and small, but Nick Saban won't budge in his handling of transfers until the league and the NCAA makes him—and his stance makes sense. Plus, more early notes from SEC spring meetings in Destin, and the rest of this week's Punt, Pass & Pork. DESTIN, Fla. — Nick Saban wants the members of his league to make a choice at this week’s SEC spring meetings. The Alabama coach has been cast as the villain in two graduate transfer sagas in the past two years. He could simply relent and eliminate the bad press, but instead he’d like to see the presidents, athletic directors and coaches discuss and decide whether the league wants to enforce its intraconference graduate transfer rule or eliminate the restrictions contained therein. In 2016, defensive back Maurice Smith wanted to leave Alabama following graduation and play immediately. The SEC’s rule calls for such a player to sit out a year unless he or she receives a waiver from the commissioner. After a standoff that lasted weeks, Saban realized the SEC wasn’t going to enforce its own rule and gave up. Currently, Saban would like to see the SEC enforce its rule if Alabama graduate Brandon Kennedy decides to play offensive line at Auburn or Tennessee—two teams Alabama plays annually. Enforcing the rule will make Saban and the SEC look bad, and the people at SEC headquarters know this. You can’t go to federal court and claim these are students and not employees and then keep graduates from choosing a new university for graduate school and immediately resuming their athletic eligibility. Non-compete clauses are for employees, not for students. So the SEC and other leagues have tried to shy away from these standoffs lest they look like hypocrites. But football coaches have different priorities. They don’t want league rivals recruiting their players, but if league rivals are going to recruit their players, they’d like to be able to do it too. So Saban made plenty of sense Tuesday when he complained that the SEC members need to decide as a group whether they want to have a rule or not. He plays the villain enough when he’s beating everyone and winning national titles. He shouldn’t have to be painted as the villain because the league won’t enforce its own rule. Saban doesn’t want to have to be the one to make that choice. If the SEC’s presidents are smart, they’ll do what Saban asks and take away that choice. Football coaches will almost always act in the manner that most helps their program. The rule currently exists. Therefore Saban would like to keep Kennedy—who has two years of eligibility remaining after graduating in three—off the field for a year if he chooses an SEC school. If the rule no longer existed, Kennedy could suit up in Auburn or Knoxville this season. These conversations are going on in every conference, but they get amplified when the SEC has them because of the passion of the fan bases and the oversized personalities of the coaches. But this seems like a good time to examine where the transfer rules are, because they’re about to change nationwide. The NCAA has a transfer working group consisting mostly of school administrators examining possible changes to overhaul a process that consistently makes coaches and athletic directors look petty and small. The biggest fear among those coaches is that all the transfer rules eventually will be lifted for graduates and undergraduates and college sports will have total free agency every year. “If you want to do that, there will be coaches recruiting off your campus,” South Carolina coach Will Muschamp said. Fear not, coach. There is little traction for any plan that allows undergraduates to transfer to another school and play immediately. Some ideas have been kicked around—players who hit an academic benchmark or players whose coaches were fired or bailed for a better job could play immediately—but school leaders don’t seem likely to reach a consensus on these issues this year. What they do seem to agree on is this: Coaches and athletic directors shouldn’t have the chance to decide where athletes can transfer on scholarship. Mid-American Conference commissioner Jon Steinbrecher, the only commissioner on the transfer working group, said that NCAA members likely will vote next month to strip away the “permission to contact*” rules that coaches and ADs have used for years to control players who wish to transfer. Undergraduate transfers still would have to sit out a year, but you’d never see another standoff like the one involving former Kansas State basketball player Leticia Romero, whose 2014 case might represent the single dumbest use of these exceedingly stupid rules. *Here’s how Permission To Contact works (or worked). The player asks his or her current school to be released to a list of potential transfer destinations. The current school can then decide which of those potential new schools is allowed to contact the player. The player can transfer anywhere but can only receive an athletic scholarship from the schools on the list approved by the school the player is leaving. Romero eventually was allowed to transfer on scholarship (and sat out a year, as per the rules), but only after Kansas State administrators were made to look foolish at every turn. The same has gone for nearly every time a football or basketball coach has tried to block a player from transferring on scholarship and the case has been made public. It usually goes like this. Step 1: Player decides to transfer and provides a list of transfer destinations. Step 2: School slashes the list to only a few schools—and none player really wants to attend. Step 3: After getting no relief from the first school, player takes the case public. Step 4: Coach/AD is publicly shamed and eventually relents, allowing player to transfer anywhere. Here’s how that process will work beginning in October. Step 1: Player informs the NCAA that he/she would like to transfer. Step 2: Anyone can recruit player and give him/her an athletic scholarship. Step 3: Player will sit out a year (if an undergraduate) or play immediately (if a graduate). What still must be sorted out are the intraconference transfer rules such as the one Saban keeps bumping up against. Saban would like the SEC to make a hard-and-fast (or nothing-and-easy) rule for graduate transfers who move between SEC schools. Either way. Just let him know. Meanwhile, Florida and Texas A&M have proposed a rule that would eliminate the need for a waiver from the commissioner if a player transfers to another SEC school from an SEC school facing an NCAA-imposed postseason ban. This would affect the case of junior wide receiver Van Jefferson, who transferred from Ole Miss to Florida this offseason. The Rebels have been banned from this postseason by the NCAA’s Committee on Infractions. Other undergrads who have transferred to schools in other leagues have been granted waivers by the NCAA to play immediately, but Florida is waiting on a more clear SEC rule before applying for Jefferson’s waiver. Should SEC presidents vote to pass this rule, Jefferson would almost certainly get his waiver from the NCAA. This is the rare case when the schools’ interests align with the players’ interests. School leaders want to see harsher punishments for NCAA rule-breakers. Players want more freedom to transfer. It seems likely both parties will get what they want in the SEC, and this seems like the kind of rule that might be adopted by other leagues as well. What he means is this. Vanderbilt or Kentucky or Arkansas may have a solid cornerback who prospers for two or three seasons at that school. Then, as the corner is set to graduate, Alabama suddenly needs someone capable of plugging in immediately at corner. Wouldn’t it be beneficial for both parties to come together? The player could get a degree from the first school and a master’s in football (and some academic discipline) from Alabama. Saban thinks this would be a bad thing. The folks at Kentucky and Vanderbilt probably feel the same way. But it might just be best to let the college graduate decide what’s best for him at that point. And that might be exactly what the SEC decides to do this week. Girl Talk, the DJ known to his family as Gregg Gillis, put out a mashup masterpiece 10 years ago. Feed The Animals, the follow-up to 2006’s Night Ripper, might be the greatest workout/party mix ever created. It probably also launched thousands of cease-and-desist notices since it mixed hip-hop with songs from every conceivable genre with a reckless disregard for who held what copyright. Girl Talk followed Feed The Animals in 2010 with the solid All Day, but it will take a towering work to top what he mixed in 2008. So today, we’ll rank the top 10 mashups from Feed The Animals. 1. The middle school teacher who was shot three times while subduing a school shooter in Noblesville, Ind., is former Southern Illinois defensive end Jason Seaman. 2. This defies the laws of physics. 3. Two Illinois linebackers have been charged with theft after they admitted to taking a wire sculpture of a deer—appropriately called “Startled”—from a Champaign park and placing it on the roof of their apartment complex. This is your weekly reminder that college students do incredibly stupid things. When I was a sophomore in college, my roommates took the canvas image off a billboard for Pearl Jam’s recently released Yield album and used it to wallpaper the apartment. I wrote about the NCAA's dumb headset rule last week. I spent a lot of words explaining it. Saban summed it up in one sentence, and I’m jealous of his conciseness. I tried alligator ribs a few years ago at a place in Florida’s Panhandle. The results weren’t great. Too many thin bones and not enough meat made the entire endeavor a chore. That effort might have been necessary for survival hundreds of years ago, but we live in an age of pigs and cows standing ready to give their ribs to America’s smokers. Still, I couldn’t help but wonder if maybe I’d just gotten a bad batch. So when I saw that Gilbert’s Underground Kitchen served alligator ribs, I resolved to give the prehistoric beast another chance. Chef Kenny Gilbert appeared on season seven of Top Chef and later beat Bobby Flay on—you guessed it—Beat Bobby Flay by wowing the judges with chicken and ricotta dumplings. He returned to north Florida, where he ascended to chef de cuisine at the Ritz Carlton on Amelia Island at age 23, in 2015 to open a barbecue-centric spot in nearby Fernandina Beach. The place passed the smell test the moment we opened our car doors. Smokers running next to the parking lot produced an aroma that—depending on the direction of the wind—had to make every mouth water for a mile. Was there a gator in one of those smokers right now? And what might he taste like? I had to know. 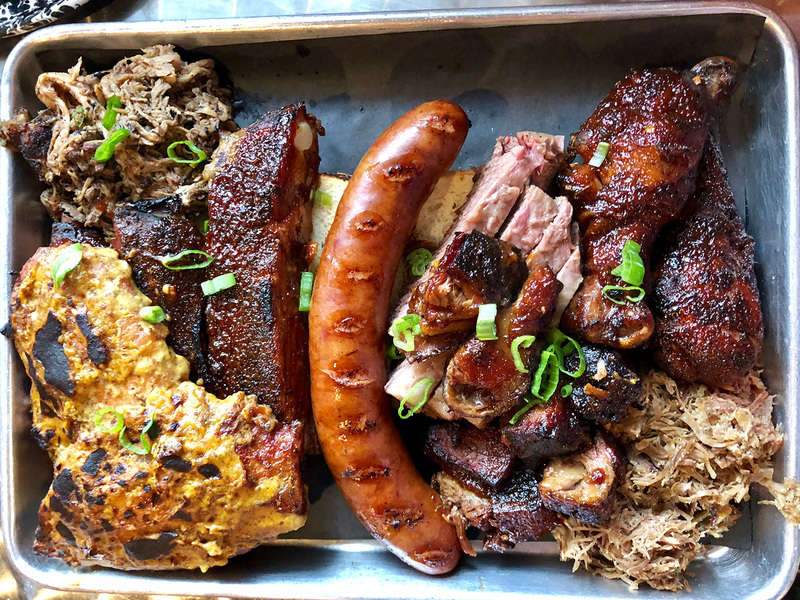 We ordered The Ultimate Sampler ($45), which would allow us to try those alligator ribs along with pulled pork, pulled turkey, andouille sausage, jerk chicken drumsticks, pork spare ribs, brisket and burnt ends. We also ordered the fried chicken skins appetizer. It’s best not to drag out the alligator rib review. It turns out I hadn’t gotten a bad batch at that place in the Panhandle. Alligator ribs just aren’t that good. I know this because Underground Kitchen made everything else taste wonderful. If they couldn’t do this with the alligator, the blame probably lies with the reptile. A spicy mustard sauce tried to liven up the gamey meat, but the gator’s anatomy makes a solid bite nearly impossible. Everything else on the tray ranged from solid to I’ll-fight-you-if-you-take-the-last-bite-of-that. Meanwhile, the appetizer will live in my best dreams for years. If you’re the kind of person whose first response to the procurement of a rotisserie chicken is to immediately strip it and gobble up the skin, welcome to the club. And now that we understand one another, feel free to imagine that skin deep fried. Yes, it’s as delicious as you’re imagining. As for the non-alligator smoked items, I’ll rank them in descending order. Consider this a bonus random ranking. Why wings got huge and drumsticks got left behind will never make sense to me. A drumstick provides multiple solid bites and minimal work. These are covered in sweet, spicy jerk seasoning. If you open a restaurant this close to the Georgia state line, you’d better make great pulled pork. Gilbert’s Underground Kitchen does. Ask for them spicy. Thank me later. They’re smoky, sweet and greasy. Exactly as they should be. This is excellent, but so was everything else. This is the only item that came from a mammal that didn’t quite wow us. It was fine, but it paled in comparison to everything else on the tray. Besides, you won’t have room for brisket when you order a second helping of collard greens. You will when you take your first bite of the bracing, sweet greens that have a hint of something you can’t quite place. That something came from the cinnamon sticks that lived in the water that cooked your greens. And long after you leave, it will call to you as often as those fried chicken skins and jerk drumsticks do.